Murder on the Orient Express is a 2017 mystery thriller film directed by Kenneth Branagh with a screenplay by Michael Green, based on the 1934 novel of the same name by Agatha Christie. The film stars Branagh as Hercule Poirot, with Penélope Cruz, Willem Dafoe, Judi Dench, Johnny Depp, Josh Gad, Derek Jacobi, Leslie Odom Jr., Michelle Pfeiffer, Olivia Colman, and Daisy Ridley in supporting roles. The film is the fourth screen adaptation of Christie's novel, following the 1974 film, a 2001 TV film version, and a 2010 episode of the television series Agatha Christie's Poirot. The plot follows Poirot, a world-renowned detective, as he seeks to solve a murder on the famous trans-European train in the 1930s. Principal photography began in November 2016 in the United Kingdom; it is one of the few productions in recent decades to have used 65 mm film cameras. Murder on the Orient Express had its world premiere on November 2, 2017 at Royal Albert Hall in London, and was released in theatres in the United Kingdom on November 3, 2017, and in the United States on November 10, 2017, by 20th Century Fox. The film grossed over $351 million worldwide and received mixed reviews from critics, with praise for the cast's performances and the production value, but some criticism for not adding anything new to previous adaptations. A sequel, titled Death on the Nile, is scheduled for a release on October 2, 2020. In 1934, famous Belgian detective Hercule Poirot solves a theft at the Church of the Holy Sepulchre in Jerusalem. The obsessive-compulsive sleuth—who seeks balance in life, and considers his case-solving ability to see a lie amid truth to be a curse—wants to rest in Istanbul, but must return to London for another case. His friend Bouc, nephew of the director of the Simplon-route Orient Express service, arranges a bunk for him aboard the train. Unscrupulous businessman Edward Ratchett offers to hire Poirot as his bodyguard during the three-day journey, having received threatening letters from an unknown party, but Poirot refuses. That night, Poirot hears strange noises coming from Ratchett's compartment, and later sees someone in a red kimono running down the hallway. An avalanche derails the train's engine, stranding the passengers. The next morning, Poirot discovers Ratchett was murdered during the night, having been stabbed a dozen times. Poirot and Bouc investigate the other passengers as repairs begin. Evidence indicates that Ratchett was murdered by one person, and Caroline Hubbard, a fellow passenger, claims that a man had been in her compartment in the night. Poirot discovers a partially burned note connecting Ratchett to the kidnapping of Daisy Armstrong, a child who was abducted from her bedroom and held for ransom. Ratchett's true identity is exposed: He was John Cassetti, Daisy's kidnapper and murderer. Although her family paid the ransom, Daisy was murdered anyway. Her death so profoundly shocked her mother Sonia, that she gave birth prematurely to a stillborn baby and subsequently died herself; Daisy's father, Colonel John Armstrong, then committed suicide. Susanne, the family's nursemaid, was wrongly suspected of complicity, arrested, and subsequently committed suicide in police custody, only later to be found innocent. More evidence is found, including Cassetti's coffee cup laced with barbital, an embroidered handkerchief and, in Mrs. Hubbard's compartment, the button of a conductor's uniform. The uniform is later found, as is the red kimono—in Poirot's own suitcase. Hubbard is suddenly stabbed in the back; she survives but cannot identify the culprit. Poirot discovers many of the passengers have direct connections to the Armstrong family and uncovers their hidden pasts. While interviewing governess Mary Debenham, Poirot is shot in the shoulder by her fiancé Doctor John Arbuthnot, who claims responsibility for the murder, but Bouc stops him from killing Poirot. Poirot realizes that Arbuthnot never meant to kill him—a decorated army sniper and medical doctor could not have missed making a fatal shot at close range. Poirot confronts the suspects outside the train, offering two theories of how Cassetti died. The first is simple but does not meet all of the facts: A murderer disguised as a conductor boarded the train at a previous stop, murdered Cassetti, and fled at the stop as the train left. The second is more complex: with every single suspect connected in some way to the Armstrongs, Susanne, or her trial, they all had a motive against Cassetti. Poirot predicts that they acted together. Hubbard is revealed to be Linda Arden (a former stage actress and aspiring director) who is Sonia Armstrong and passenger Helena Andrenyi's mother, Debenham to be Daisy's former governess, Arbuthnot to be an old friend of Daisy's father, Pilar Estravados was Daisy's nurse, Beniamino Marquez was the Armstrong's chauffeur, elderly Princess Natalya Dragomiroff, a close friend of Linda's was Daisy's Godmother, Hector McQueen being both Ratchett's assistant and the son of Susanne's Prosecutor, E.H. Masterman both Ratchett's majordomo and – as he himself declares – a member of Colonel Armstrong's war troop in World War I, Fräulein Hildegarde Schmidt was the Armstrong family's cook, Helena's husband count Rudolph Andrenyi was Sonia Armstrong's brother in-law, and Gerhard Hardman was the police officer in charge of the Armstrong case, who fell in love with Susanne. Hubbard confirms the latter, admitting that she planned the murder and had recruited everyone else to help her. All the other passengers and the conductor, Pierre Michel (Susanne's brother), took turns stabbing Cassetti so none of them would know who struck the deadly blow. Mary wore the kimono, and Arbuthnot stabbed Hubbard at her direction without endangering her life, to convince Poirot of a lone killer. Poirot challenges the passengers and Michel to shoot him with a confiscated gun since he is the only one who can expose their plot; Bouc can lie, but Poirot, obsessed with truth and balance, cannot. Hubbard grabs the gun and attempts suicide, but it is not loaded; Poirot wanted to see how the suspects would react, and Hubbard's reaction confirms that they are not killers at heart. With the train back on track, Poirot concludes that justice is impossible in this case, as Cassetti deserved death; for the first time, Poirot will have to live with a lie and imbalance. He presents the lone killer theory to the Yugoslavian police, allowing the others to leave on the train. As he disembarks, a British Army messenger asks him to investigate a death on the Nile. Poirot accepts the case. The collective culprits led by Hubbard all go free. 20th Century Fox announced the project in December 2013. 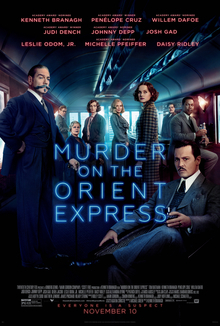 Michael Green wrote the screenplay for a new film adaptation of Murder on the Orient Express. On June 16, 2015, it was reported Fox was in talks with Kenneth Branagh to direct. On November 20, 2015, it was announced that Branagh would both direct the film and star in the role of detective Hercule Poirot. He later said that he "enjoyed finding the sort of obsessive-compulsive in [Poirot] rather than the dandy." In June 2016, Angelina Jolie entered into "talks" to join the cast of the film, in the role of Mrs. Caroline Hubbard However, it was later reported that Jolie had passed on the role and that Charlize Theron, among others, was in consideration for the role. In August 2016, Leslie Odom Jr. joined the cast. In September 2016, Tom Bateman, Johnny Depp, Michelle Pfeiffer, Daisy Ridley, Michael Pena, Judi Dench, Lucy Boynton and Derek Jacobi joined the cast. In October 2016, Josh Gad, and Marwan Kenzari joined the cast. In November 2016, Penelope Cruz joined the cast. In December 2016, Sergei Polunin joined the cast. In January 2017, William Dafoe and Manuel Garcia-Rulfo joined the cast with the latter replacing Pena, who had dropped out of the project. Principal photography on the film began on November 22, 2016, in the United Kingdom, and concluded in May 2017. It used some of the same 65mm film cameras as Christopher Nolan's Dunkirk, which Branagh had acted in shortly before the production. The two were among the very few to be shot on 65 mm film since Branagh's Hamlet in 1996, and the only ones released in 2017. While in post-production, Branagh "was Skyped in from thousands of miles away" to watch Pfeiffer record an original song called "Never Forget" for the film's finale. "As soon as we added it on to the end of the film, it joined seamlessly and gave a moment of reflection and consideration that the film needed and wanted," said Branagh. A first look at the film and cast was released on May 3, 2017, in an exclusive article by Entertainment Weekly. Murder on the Orient Express was released in the United Kingdom on November 3, 2017 and in the United States on November 10, 2017, by 20th Century Fox. The film was released on digital HD on February 20, 2018, and on Ultra HD Blu-ray, DVD and Blu-ray on February 27, 2018. Murder on the Orient Express grossed $102.8 million in North America, and $250 million overseas, for a worldwide total of $352.8 million, against a production budget of $55 million. In the United States and Canada, Murder on the Orient Express was released alongside Daddy's Home 2, and was projected to gross around $20 million from 3,341 theaters in its opening weekend. The film made $10.9 million on its first day, including $1.6 million from Thursday night previews at 2,775 theaters. It ended up grossing $28.7 million, finishing third at the box office, behind holdover Thor: Ragnarok, and Daddy's Home 2. 51% of the film's opening weekend audience was over the age of 35. In its second weekend, the film took in $13.8 million (a drop of 51.9%), finishing fifth, behind Justice League, Wonder, Thor: Ragnarok and Daddy's Home 2. On review aggregator Rotten Tomatoes, the film has an approval rating of 58%, based on 247 reviews, with an average rating of 6.1/10. The website's critical consensus reads, "Stylish production and an all-star ensemble keep this Murder on the Orient Express from running off the rails, even if it never quite builds up to its classic predecessor's illustrious head of steam." On Metacritic the film has a weighted average score of 52 out of 100, based on 45 critics, indicating "mixed or average reviews". Audiences polled by CinemaScore gave the film an average grade of "B" (on an A+ to F scale). Leah Greenblatt of Entertainment Weekly gave the film a B+, calling it "a lushly old-fashioned adaptation wrapped in a veritable turducken of pearls, monocles, and international movie stars." Blake Goble of Consequence of Sound said, "Handsomely staged, exceptionally well-cast, and reasonably faithful, Branagh has revived Murder on the Orient Express in a highly pleasing fashion." Trace Thurman of Bloody Disgusting gave the film three and a half skulls and said, "For those looking for an involving murder mystery that is respectful of its source material and filled with an all-star cast, look no further than Murder on the Orient Express." Matt Goldberg of Collider gave the film a B−, calling it a "handsomely crafted production," albeit one that "falls apart at the climax of the film." Josephine Livingstone of The New Republic praised the film's "stylized gorgeousness," but wrote that Branagh's change of "Poirot's fussiness ... into obsessive compulsive tendencies" was "less distinct and, ultimately, less interesting". On the negative side, Matthew Jacobs of The Huffington Post was impressed by the cast, but ultimately felt "Agatha Christie's whodunit has no steam." Peter Travers of Rolling Stone found that there were many dull moments and that the film was a needless remake. Richard Roeper of the Chicago Sun-Times gave the film two and a half stars, and stated that he felt it focused too much on Poirot to the detriment of the other characters, adding, "Never let it be said the director misses an opportunity to place his star front and center, unfortunately relegating just about everyone else in the obligatory international all-star cast to a paper-thin character with one or at most two defining personality traits." Ignatiy Vishnevetsky of The A.V. Club rated the film a C+ and complained that Branagh's "erratic direction—more interested in cut glass and overhead shots than in suspicions and uncertainties—bungles both the perfect puzzle logic of the crime and its devious solution." Christopher Orr of The Atlantic said the film was "visually sumptuous yet otherwise inert" and summed up, "Murder on the Orient Express is not a bad movie per-se, merely one that feels self-indulgent and thoroughly unnecessary." In 2015, Christie's great-grandson James Prichard, Chairman of Agatha Christie Ltd., expressed enthusiasm for sequels, citing the positive collaboration with Branagh and the production team. In May 2017, Branagh expressed interest in further installments if the film were successful. On November 20, 2017, 20th Century Fox announced that a sequel, based on the 1937 novel Death on the Nile, was in active development, with Michael Green, screenwriter of the first film, returning to write the screenplay. Branagh will again be both director and star. "I think there are possibilities, aren't there? With 66 books and short stories and plays, she — and she often brings people together in her own books actually, so innately — she enjoyed that," he says. "You feel as though there is a world — just like with Dickens, there's a complete world that she's created — certain kinds of characters who live in her world — that I think has real possibilities." In February 2018, Fox scheduled Death on the Nile for release on November 8, 2019, with Branagh officially signed to direct and star. However, in June 2018, the film was pushed back to December 20, 2019. On October 16, 2018, the sequel was pushed back to October 2, 2020. ^ a b Debruge, Peter (November 7, 2017). "Film Review: Murder on the Orient Express". Variety. Retrieved November 9, 2017. ^ a b c McCarthy, Todd (November 10, 2017). "Murder on the Orient Express: Film review". The Hollywood Reporter. Retrieved November 9, 2017. ^ "Murder on the Orient Express (12A)". British Board of Film Classification. Retrieved October 22, 2017. ^ a b "Murder on the Orient Express(2017)". LUMIERE. Retrieved May 23, 2018. ^ a b c "Murder on the Orient Express (2017)". Box Office Mojo. Retrieved June 15, 2018. ^ Mitchell, Robert (May 5, 2017). "All-Star 'Murder on the Orient Express' Cast Assembles in London". Variety. ^ "The Murder On The Orient Express world premiere red carpet". Yahoo! Movies. November 1, 2017. ^ McNary, Dave (December 12, 2013). "Fox Remaking Murder on the Orient Express". Variety. Exclusive. Retrieved November 25, 2015. ^ McNary, Dave; McNary, Dave (March 10, 2015). "'Murder on the Orient Express' Reboot Sets Michael Green as Writer (EXCLUSIVE)". Retrieved March 23, 2019. ^ Geier, Thom (June 16, 2015). "Kenneth Branagh in talks to direct Agatha Christie's Murder on the Orient Express". TheWrap. Exclusive. Retrieved July 11, 2015. ^ a b McNary, Dave (November 20, 2015). "Kenneth Branagh to direct, star in Murder on the Orient Express remake". Variety. Penske Business Media. Retrieved November 25, 2015. ^ McEvers, Kelly. "Kenneth Branagh on his meticulous master detective role in Murder on the Orient Express" (Interview). All Things Considered. Retrieved November 26, 2017. ^ Siegel, Tatiana (June 16, 2016). "Angelina Jolie in Talks to Star in 'Murder on the Orient Express'". The Hollywood Reporter. Retrieved March 23, 2019. ^ Lang, Brent (August 4, 2016). "Angelina Jolie No Longer Boarding 'Murder on the Orient Express' (EXCLUSIVE)". Retrieved March 23, 2019. ^ McNary, Dave (August 17, 2016). "'Hamilton' Star Leslie Odom Jr. in Talks to Join 'Murder on the Orient Express' (EXCLUSIVE)". Variety. Retrieved March 23, 2019. ^ Ford, Rebecca (September 6, 2016). "'Murder on the Orient Express' Adding Tom Bateman (Exclusive)". The Hollywood Reporter. Retrieved March 23, 2019. ^ Ford, Rebecca; Kit, Borys (September 29, 2016). "Johnny Depp in Talks to Star in 'Murder on the Orient Express'". The Hollywood Reporter. Retrieved March 23, 2019. ^ Kit, Borys; Ford, Rebecca (September 29, 2016). "Michelle Pfeiffer, Daisy Ridley, Michael Pena, Judi Dench Board 'Murder on the Orient Express' (Exclusive)". The Hollywood Reporter. Retrieved March 23, 2019. ^ Kit, Borys (October 20, 2016). "Josh Gad Joins Kenneth Branagh, Johnny Depp in 'Murder on the Orient Express'". The Hollywood Reporter. Retrieved March 23, 2019. ^ Kit, Borys (October 27, 2016). "'Mummy' Actor Marwan Kenzari Joins Johnny Depp in 'Murder on the Orient Express' (Exclusive)". The Hollywood Reporter. Retrieved March 23, 2019. ^ Busch, Anita; Jr, Mike Fleming (November 11, 2016). "Penelope Cruz Joins 'Murder On The Orient Express'". Deadline Hollywood. Retrieved March 23, 2019. ^ Ritman, Alex (December 5, 2016). "Ballet Star Sergei Polunin Lands Roles in 'Murder on the Orient Express,' 'Red Sparrow' (Exclusive)". The Hollywood Reporter. Retrieved March 23, 2019. ^ Ford, Rebecca (January 5, 2017). "Willem Dafoe Joins 'Murder on the Orient Express'". The Hollywood Reporter. Retrieved March 23, 2019. ^ N'Duka, Amanda (January 25, 2017). "Manuel Garcia-Rulfo Boards 'Murder On The Orient Express'; Vivica A. Fox Joins 'The Mafia Aint Dead'". Retrieved March 23, 2019. ^ Daniels, Nia (November 22, 2016). "Murder on the Orient Express starts filming". The Knowledge. Retrieved November 22, 2016. ^ Daniels, Nia (November 15, 2016). "Murder on the Orient Express sets up UK shoot". KFTV. Retrieved November 22, 2016. ^ Ritman, Alex (October 27, 2017). "Kenneth Branagh on Finding the Perfect Mustache for 'Murder on the Orient Express'". The Hollywood Reporter. Retrieved November 9, 2017. ^ Wooding, Andy (December 6, 2017). "Kenneth Branagh and Patrick Doyle talk Murder on the Orient Express music". Film Doctor. Retrieved December 6, 2017. ^ Collis, Clark (May 3, 2017). "This week's cover: Exclusive first look at Murder on the Orient Express". Entertainment Weekly. Retrieved May 3, 2017. ^ Lang, Brett (April 22, 2017). "Steven Spielberg Pentagon Papers drama gets 2017 Oscar season release". Variety. Retrieved April 22, 2017. ^ D'Alessandro, Anthony (October 25, 2017). "Thor rocks on with $10.8 M Tuesday; will continue to strike lightning in second weekend with $60 M". Deadline Hollywood. ^ a b D'Alessandro, Anthony (November 11, 2017). "Daddy's Home 2 higher than the Orient Express in a 'Ragnarok'-ruled weekend – Early Sunday AM update". Deadline Hollywood. Retrieved November 11, 2017. ^ D'Alessandro, Anthony (November 19, 2017). "'Justice League' encounters kryptonite at The B.O. with $96 M opening: Why the DC movie weakened – Sunday AM update". Deadline Hollywood. Retrieved November 19, 2017. ^ "Murder on the Orient Express (2017)". Rotten Tomatoes. Retrieved April 23, 2018. ^ "Murder on the Orient Express Reviews". Metacritic. Retrieved December 23, 2017. ^ Greenblatt, Leah (November 7, 2017). "Murder on the Orient Express is a lushly old-fashioned whodunit: EW review". Entertainment Weekly. Retrieved November 8, 2017. ^ Goble, Blake (November 8, 2017). "Film Review: Murder on the Orient Express". Consequence of Sound. Retrieved November 8, 2017. ^ Thurman, Trace (November 8, 2017). "[Review] 'Murder on the Orient Express' is a Lovely Ode to Old-Fashioned Murder Mysteries". Bloody Disgusting. Retrieved November 9, 2017. ^ Goldberg, Matt (November 9, 2017). "Murder on the Orient Express review: A good yarn that frays at the end". Collider. Retrieved November 9, 2017. ^ Livingstone, Josephine (November 8, 2017). "Murder on the Orient Express is a spectacular massacre of a classic". The New Republic. Retrieved November 26, 2017. ^ Jacobs, Matthew (November 8, 2017). "Murder on the Orient Express pulls into the reboot station. All aboard! Or not". HuffPost. Retrieved November 8, 2017. ^ Travers, Peter (November 7, 2017). "Murder on the Orient Express review: Whodunnit redo is fast train to nowhere". Rolling Stone. Retrieved November 8, 2017. ^ Roeper, Richard (November 8, 2017). "Others sent to back of train in Branagh's 'Murder on Orient Express'". Chicago Sun-Times. Retrieved November 8, 2017. ^ Vishnevetsky, Ignatiy (November 8, 2017). "A perfect mystery jumps the rails in the star-studded Murder on the Orient Express". The A.V. Club. Retrieved November 9, 2017. ^ Orr, Christopher (November 10, 2017). "Murder on the Orient Express is a ride worth skipping". The Atlantic. Retrieved December 27, 2017. ^ "2017 AWFJ EDA Award nominees". Alliance of Women Film Journalists. January 3, 2018. Archived from the original on January 3, 2018. Retrieved January 22, 2018. ^ Giardina, Carolyn (January 4, 2018). "Art Directors Guild Awards: Dunkirk, Shape of Water, Blade Runner 2049 Among Nominees". The Hollywood Reporter. Retrieved January 22, 2018. ^ Stone, Sasha (January 10, 2018). "Costume Designers Guild Announces Nominees". Awards Daily. Retrieved January 22, 2018. ^ "Shape of Water leads critics' choice film nominations". Variety. December 6, 2017. Retrieved January 22, 2018. ^ Meechan, Lauren (January 12, 2018). "Critics' Choice Awards 2018 winners: The Shape of Water and Big Little Lies sweep board". Daily Express. Retrieved January 22, 2018. ^ Ritman, Alex (January 22, 2018). "Star Wars: The Last Jedi leads nominations for U.K.'s Empire Awards". The Hollywood Reporter. Retrieved January 29, 2018. ^ Darling, Cary (December 12, 2017). "The Shape of Water inundates Houston critics' film awards nominations". Houston Chronicle. Retrieved January 22, 2018. ^ Neglia, Matt (December 18, 2017). "The 2017 Las Vegas Film Critics Society (LVFCS) winners". Next Best Picture. Retrieved January 22, 2018. ^ Tartaglione, Nancy (December 15, 2017). ""Three Billboards" Leads London Critics' Circle Film Award Nominations". Deadline Hollywood. Retrieved January 22, 2018. ^ Tangcay, Jazz (December 11, 2017). "Phoenix Critics Circle announce their nominations". Awards Daily. Retrieved January 22, 2018. ^ "PFCS 2017 Award Winners". Phoenix Film Critics Society. Retrieved January 22, 2018. ^ Pond, Steve (November 29, 2017). "Dunkirk, The Shape of Water lead Satellite Award nominations". TheWrap. Retrieved January 22, 2018. ^ McNary, Dave (March 15, 2018). "Black Panther, Walking Dead rule Saturn Awards nominations". Variety. Archived from the original on March 15, 2018. Retrieved March 15, 2018. ^ "'Blade Runner 2049' Leads the 2017 Seattle Film Critics Society Nominations". Seattle Film Critics Society. December 11, 2017. Retrieved January 22, 2018. ^ Douglas, Esme. "Teen Choice Awards 2018: See the full list of winners". Entertainment Weekly. Archived from the original on August 13, 2018. Retrieved August 13, 2018. ^ "Murder on the Orient Express star Kenneth Branagh wants to make more Poirot movies". Entertainment Weekly. May 4, 2017. Retrieved May 31, 2017. ^ Kit, Borys (November 20, 2017). "'Murder on the Orient Express' sequel in the works". The Hollywood Reporter. Exclusive. Retrieved November 30, 2017. ^ a b Pearson, Ryan (December 26, 2017). "Branagh teases return of old friends in Death on the Nile". Associated Press. Retrieved December 27, 2017. ^ Goldberg, Matt (February 13, 2018). "Fox pushes back Alita and The Predator; dates Murder on the Orient Express sequel". Collider. Retrieved April 12, 2018. ^ Haring, Bruce (June 22, 2018). "20th Century Fox sets dates for untitled James Mangold Ferrari project, Kenneth Branagh's Death on the Nile". Deadline Hollywood. Retrieved September 16, 2018. ^ McNary, Dave (October 17, 2018). "Film News Roundup: 1963 U.S. Naval Academy Football Team to Get Doc Treatment". Variety. Retrieved October 19, 2018.